A small, computer battery backup unit turned into a pentesting dropbox. This project was created on 04/29/2018 and last updated a year ago. This is a small computer battery backup unit turned into a pentesting dropbox. It is meant to be setup behind a computer or any small networking equipment and go unnoticed, while the pentester has remote access into the network through it. The goal was to make the device as functional as possible, while maintaining the stock look of the original BBU. This is a small computer battery backup unit turned into a pentesting dropbox. It is meant to be setup behind a computer or any small networking equipment and go unnoticed, while the pentester has remote access into the network through it. The goal was to make the device as functional as possible, while maintaining the stock look of the original BBU. I wanted the parts to be somewhat modular, so I kept as many connectors as possible and even added more. While out in the field, the switch can be swapped out with a network tap, the Pi can be swapped out with a Beaglebone, or everything inside can be swapped with an ESPRESSObin. Major components won&apos;t need resoldering. 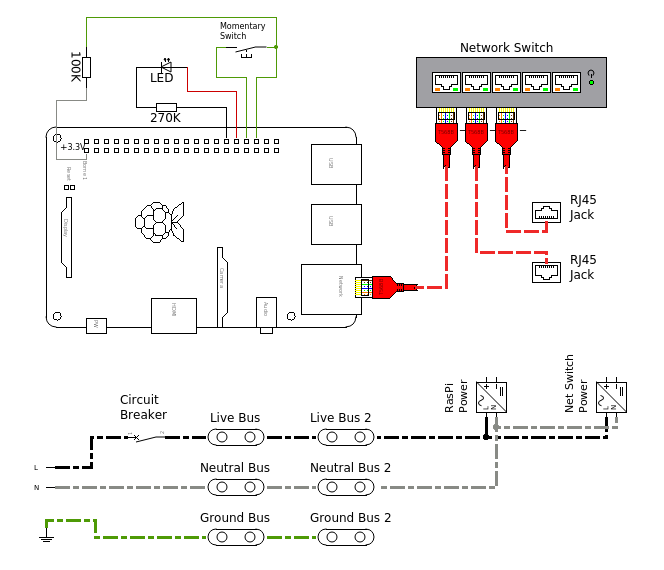 The main components are the shell and a few pieces of an old BBU, small 5V five-port network switch, and a Raspberry Pi or any small computer that will fit. Everything was built with simple tools (no 3D printer needed!). I was trying to make this as easy to replicate and build upon as possible. Reboot & shutdown the Pi with a push of a button. I wrote this in bash, so it should work on most Linux distros. Flash an LED connected to the GPIO. I wrote this in bash, so it should work on most Linux distros. 1 × Battery backup unit Can be any size. Obviously the bigger it is, the more stuff you can fit in the case! 1 × Brain I used a Raspberry Pi 2 B that I had laying around. 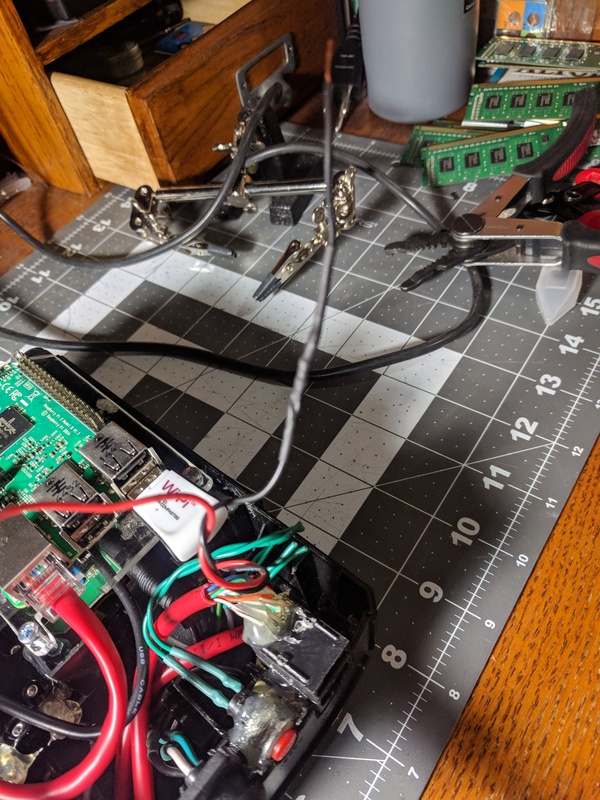 1 × Connectors or test leads (Optional) To attach the LED and switch to the GPIO on the Pi. 2 × Ethernet cable Need to be fairly short and flexible. 2 × RJ45 ethernet jack (Optional) I used a couple of solder-on jacks from another BBU, to keep the stock look. I have all the pictures I&apos;ve taken so far uploaded! Next I&apos;ll start organizing and laying out the steps I took to build it. This is also my first project I haven&apos;t just imported and edited from Instructables, so it may take a bit to get everything documented. Remove all of the screws on the battery backup unit and set them aside. Remove all unnecessary components, like the old circuit board and batteries. Save the usable parts, like the various lengths of wire, power cord, LEDs, RJ45 jacks, switches, and the enclosure with outlets intact. Remove the plastic housing on the network switch to save space. Also, remove the plastic on the power adapters. Next, we&apos;re going to start extending wires and mapping out where we want things to go. I like to add plenty of wire ahead of time and trim to fit as I go. Extend the wires coming from the power cord and solder the white and green to the proper sides on one set of bus bars of the outlets. The black needs to be soldered on, too, but we&apos;ll come back to it. Add jumper wires between the two sets of outlet bars (all three bars). Most BBUs come with a surge only side and a battery + surge side. We will be joining both sides to create a simple power strip. Solder separate wires to the hot and neutral rails to attach the Raspberry Pi and network switch adapters later. This can be two hot and two neutral wires or just one of each to daisy chain the adapters. Now for that black wire of the power cord. I saved the large breaker button when tearing down the BBU. 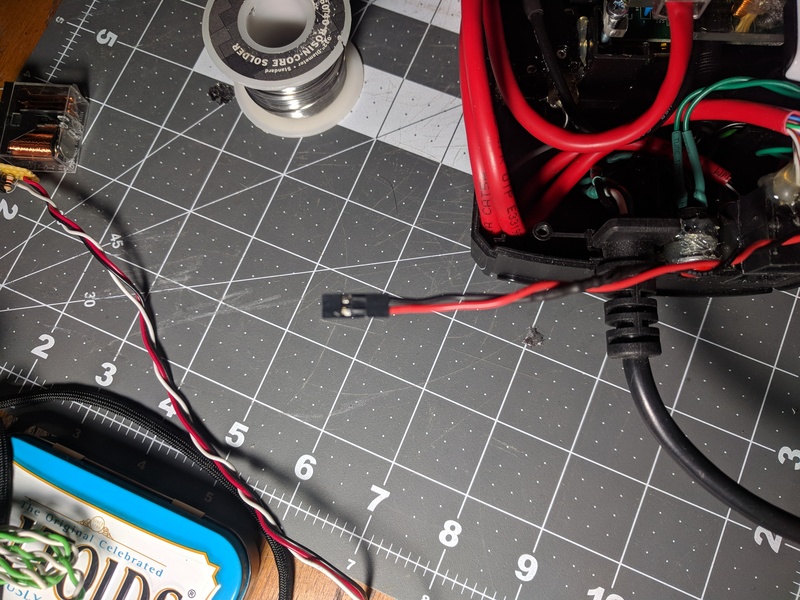 If you still have it or maybe a 10A or 15A fuse, solder one terminal to the black wire on the power cord and the other terminal to an extension wire. That extension wire gets soldered to the hot bus bar on the outlet you soldered the neutral (white) and ground (green) wires to. Now we&apos;re going to wire up the power adapters for the switch and Pi. I used two separate identical adapters, because 2A is just enough for the Pi&apos;s recommended input current and the second one would have some current to spare with the 800mA the switch would pull. First solder the hot and neutral wires you added to the bus bars in the last step to the adapters&apos; mains in (side where the big metal blades were connected). Now cover the connections in hot glue to keep them from wiggling around or shorting on something else later. Find a good spot in your enclosure to glue or screw them to, and, if yours is like mine, make sure to leave room to plug in your USB cable. Repeat the steps for the second adapter. You can also daisy chain them in parallel, if you only soldered one set of wires onto the bus bars. You are about to report the project "Pentesting BBU Dropbox", please tell us the reason.